Here we are, the release weekend for Masters 25 and we’ve got an oddity: People have been able to draft this set online for a week now. Will that change the in-person experience? Hopefully not, but tell me how that goes. Opening A25 packs is a real rollercoaster. There are, as of this writing, 18 rares and mythics that are at the MSRP of $10 for the pack. That leaves 50 of them that aren’t, so you’ve got a 26% chance of getting your money back from one pack. For an equivalent set of odds, I need you to flip a coin, twice, and have it come up heads both times. Then do that three times, for the three packs you’d open in a draft. There’s really high variance on the foils as well, and take foil Prossh immediately. What I want to look at today is the trend lines for some of the cards. All of them are downward, as befits a set that is going from pre-order hype to being opened, but some of these are really impressive and with only six weeks until Dominaria, it’s time to get the wallets ready. He’s down about 30% so far and clearly isn’t done as the market gluts this weekend with everyone tearing open their boxes. On eBay, I see some Buy it Now in the $90 range and even that I’m not big on. This summer, we’re getting Signature Spellbook: Jace for $20 and that’s not going to contain JTMS. Let’s be clear about that. Wizards isn’t that crazy. I’m 99% sure they won’t. I’ll let you guess who it’ll be but that’s the last shot at Big Jace for some time. JTMS is not immediately lighting up Modern. Is he good? Indisputably. Is he broken? No…..t yet. Early results are promising, though. It’s a powerful card that can take over a game, but it’s not a slam-and-win card. 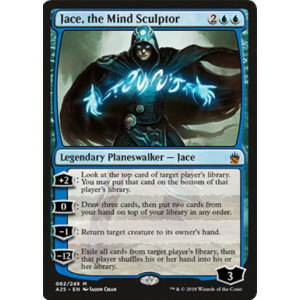 I expect Jace’s price to keep sliding, and as the headliner for Masters 25, that doesn’t bode well for the overall value of the set. My prediction for his price at Dominaria’s release in six weeks: $75 on eBay will get you a copy. You’ll definitely be able to get a playset under $300. Should you buy at that price: If you’re going to play it, yes. For spec purposes, no. Jace will tick up slowly from this new price point, but the growth will be relatively slow. Even winning a PT isn’t going to do much to his price, it’s not like Liliana of the Veil breaks $200 because it wins. I’d expect that if the price gets too high, he will get reprinted again. A Portal: Three Kingdoms card who’s enjoyed in Legacy Aluren, this has mostly been a Cube and Commander card. Let’s not overlook that there’s a judge foil of this already made, so it’s not like Masters 25 has the only reprinting or even the only foil. Yes, this has a sweet watermark but that’s only going to matter to a few people. But what war will you fight with him? 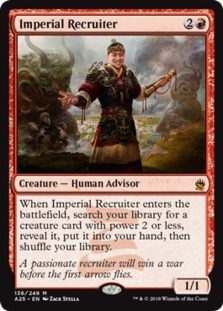 Recruiter plus sufficient mana means Kiki-Jiki combo. First one finds KJ, then it gets copied and finds the Pestermite or Exarch, GG. That’s been enough, plus the scarcity of P3K, to keep the price high but the really low demand has this falling and fast. Sure, there’s good stuff you can go find in your EDH deck, but there’s no shortage of tutors already for creatures. Dominaria price: $40. Mark it down. People will buy one, if that many. The supply will be much greater than the demand. I wouldn’t be shocked to see someone sell a playset for $120 on eBay. Should you buy at that price: Absolutely not. Get the one you need and then do nothing else with this card. It’s not done, people. There’s BIN on eBay for $35 right now, $30 on TCG, and this is not the . Yes, it’s a four-of in a tier 2 Legacy deck, but that’s it for the demand. The land is terrible in Commander, good in some Cubes, and is a real stay-away for me. Dominaria price: $25. I won’t be shocked if it’s $20, either. This price was all due to a tiny supply that the judge promo didn’t do much to lower. Now we’re getting a large influx of supply, and this is on top of how most people that wanted to play Death and Taxes already got their Ports. Given the distribution to Wal-Mart and such, it might well be that the circulation of this card as a rare in Masters 25 in 2018 is equal to the number that was originally printed in 1999. Should you buy at that price: I would get in at $10 a copy, but that’s it. 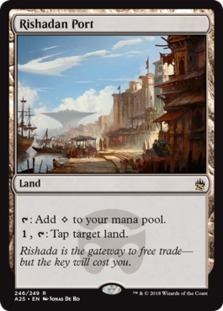 I’d be understanding of the decision to set aside a playset in anticipation of Death and Taxes winning a large event on camera, but that’s a marginal case. There are just so few areas of demand for this card. I’m excited about this printing, which came along at the perfect time. 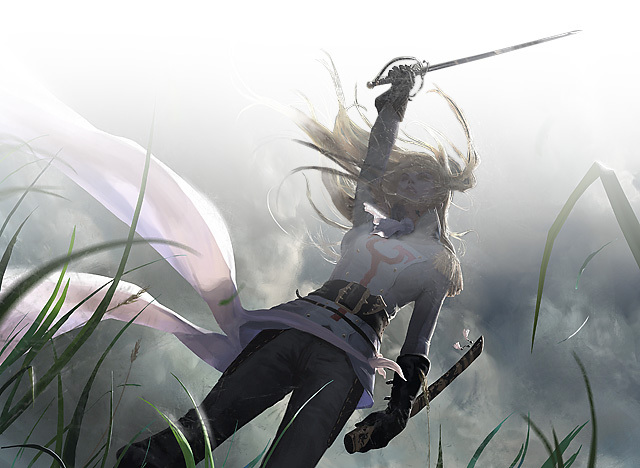 Thalia is a star in every format where she can be played, and that includes Commander. Put her in play and then watch the dirty looks people give you. It’s heartwarming. Even better, she’s almost always a four-of, which is what you want in a spec target. Dominaria price: $6-$7. That’s about where she got to during her last printing and she wasn’t nearly as popular then. Should you buy at that price: 100% yes. Even Jace will have to pay a Thalia tax, she beats Bloodbraid in a fair fight, and is possibly the two drop you want most in the ever-popular Humans deck. She’ll get back to $15 within a year and $20 not long after that. Be warned, though, that when she makes it up you need to let her go–Wizards is going to reprint her again. Other quick hits: Vendilion Clique will migrate down to $15 and hold that price, in line with the other printings. Ensnaring Bridge will stop at $30. Blood Moon at $20. The filter lands will stay in the $10 range, except for the blue ones which will be a couple bucks more. Animar, Soul of Elements is an $8 card but the foil will be something ridiculous.